All children from Nursery to Year 6 took part in our school Science day – science activities were based around a popular children’s story. 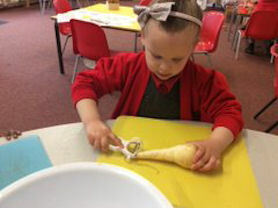 Nursery - ‘Oliver’s vegetables’ children explored vegetables, completed vegetable printing and made their very own vegetable soup! Reception - ‘Superworm’ children learnt about earthworms, observed and drew worms and then all children made their own wormery to take home! Year 1 - ‘Cinder the Bubble Blowing Dragon’ Children investigated bubbles, made giant bubbles and then made their own bubble blowing dragon. Year 2 - ‘The day the crayons quit’ the children investigated colours, they made skittles patterns and observed how the paper towel absorbed the coloured water. 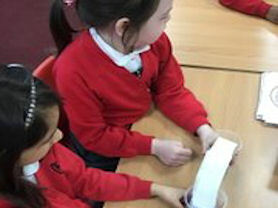 Year 3 - ‘Charlie and the chocolate factory’ Children used their senses to identify different types of chocolate, observed what happens when chocolate is heated and investigated which chocolate bars would sink or float. Year 5 - ‘George’s Marvelous Medicine’ Children made lots of exiting concoctions, watched the effect of putting mentos into Cola and made their own slime! 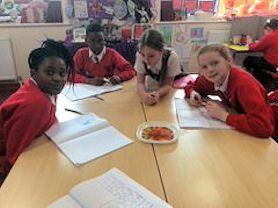 Year 6 - ‘The boy with the pig heart’ Children investigated blood, what is made up of and then made a replica ‘blood soup’ to show the components that made up our blood. Peeling and cutting in Nursery. 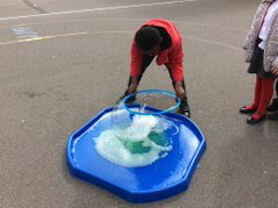 Year 1 enjoy bubble making. Mixing colours in Year 2.